Mobile Voip application for iPhone : by Mo-Call | Free Pc to Phone Calls, Free Voip Calls to India International ! Following the press release by Mo-Call. Try Mo-Call with free trial credit. 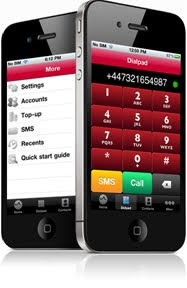 London – In keeping with its strategy to support all users on all handsets, Morodo is pleased to announce that MO-Call 2.0, its mobile VoIP app will now be available to download for the iPhone 4. MO-Call 2.0 is the biggest update since the popular application was created and approved by Apple to run on their iPhone devices. The enhanced app contains a vast number of new features including a new user interface, additional payment options and full account features such as call records, order history and SMS delivery reports. MO-Call is free to download launched in December 2007, already enables people from around the world to enjoy cheap international calls and low-cost SMS. The latest MO-Call iPhone app is available free from Apple App Store & iTunes. Seeking to re-define the way we communicate via mobile devices and the Internet, Morodo helps people with international lifestyles keep in touch with whomever they want, whenever they want, from any device they want. Morodo provides telecommunications services to hundreds of thousands of people around the world through the MO-Call software applications for mobiles and computers. Simple and seamless to use, MO-Call offers easy access to free and low-cost calling for anyone, anywhere. Merry Christmas and Happy New Year from the MO-Call team.